Messrs. Pannkoke will be closed down for winter holidays from 20th December until 2nd January 2019. From 03rd January 2019 we will be back for your service. On urgent request, please send an e-mail to info@pannkoke.de. Your message will be read in any case and we will try to help you even during our winter holidays. Vacuum lifter 7025-MD2-4 is the optimum form of assistance in a glass polishing workshop if you wish to process long, narrow strips of glass measuring up to 6 metres in length. This production helper can rotate loads of up to 250 kg in a perpendicular plane across an infinitely variable range. Would you like to take a look at the function test, live, prior to delivery. With this vacuum lifter, loads weighing 1125 kg can be moved at EC construction sites. The Kombi 7441-DS3H vacuum lifterist can be extended using 6 extensions.The turning and tilting motion is powered, operated by a remote control handset. This 4-circuit vacuum lifting device provides you with sufficient safety for use at EC construction sites. This short video gives you another brief introduction to the Kombi 7441-DS3H vacuum lifter. The construction site vacuum lifter leaves no wishes unfulfilled. 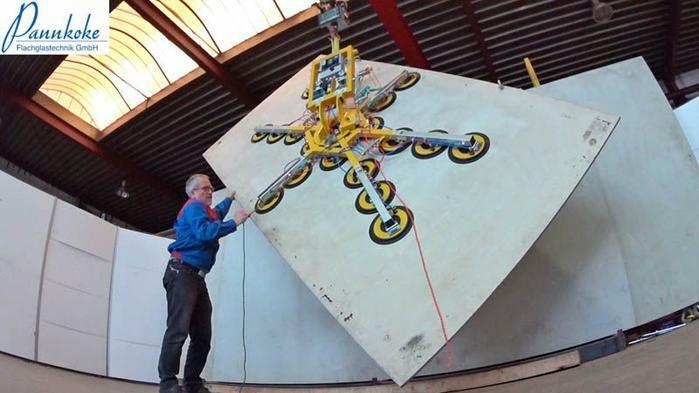 It can be used to move up to 1000 kg safely on an EU construction site. 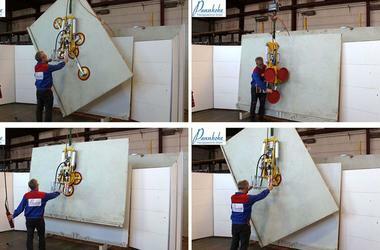 The latest version of the legendary Kombi 7211-DS3 vacuum lifter has now been produced. 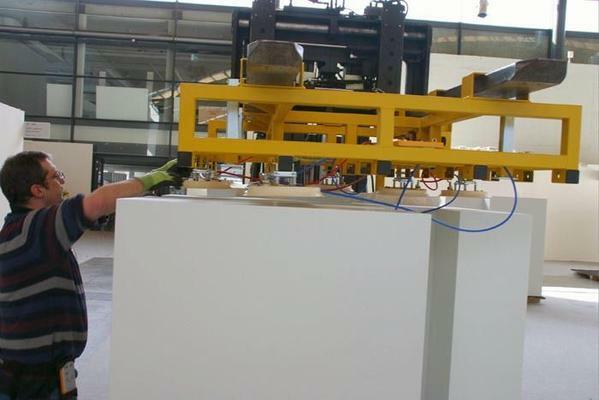 The Kombi 7211-DS3 was the first vacuum lifter with 6 extensions and was launched by us to the public at Glasstec 2004. Since the first device, many changes have been incorporated into the current version - the Kombi 7211-DS3-2018. We have made a short video of the functional test, which is like a short instruction manual for the Kombi 7211-DS3-2018. We have split this into two parts to give prospective customers a brief overview. 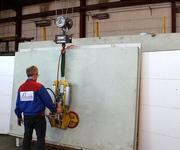 In the first part, you see how a test plate of 1200 kg is moved. In the second part, you see how the extensions are used. You will see the way from the fully configured version to the basic version of the Kombi 7211-DS3-2018. The vacuum lifter 7025-MD2-4 was created in this design to meet the requirements of our customer. The main area of use for this vacuum lifter is the production of insulating glass. This vacuum lifter, the 7025-MD2-4, is equipped with a pneumatic economy circuit, as well as with a quick-release function. The 7025-MD2-4 vacuum lifter is therefore not only economical. The low air pressure consumption and low noise pollution in the workplace mean that this vacuum lifter is also one with a ‘green thumb’. Also, a visual warning unit was fitted to this device, as requested by the customer. Take a look at this vacuum lifter which also takes care of your back. Would you like to see a video of this versatile production helper? The Telekom / Vodafone has managed to repair the line again. A miracle after 5 days. 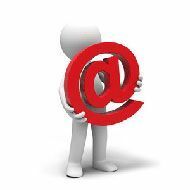 You can now reach us again via our normal email address. The Telekom / Vodafone can not repair our DSL line as fast as it is written in the advertisement. For this reason, we have not been able to receive or send e-mails since October 26th! You can send us an e-mail via Pannkoke.Zentrale@gmail.com. We hope that our providers can solve the problem soon. This little video shows how the 7005-AD/E vacuum lifter is used there. This version of this little vacuum lifter can handle loads weighing up to 200 kg. At glasstec 2014 in Düsseldorf from 21 to 24 October 2014 our trade fair stand D03 in Hall 12 will be exhibiting a few items that will make your life on the construction site a great deal easier. The flexible-jointed Kombi 7411-DSG7 vacuum lifter, capable of moving curved panes of glass weighing up to 750 kg. Click here for more information about the Kombi 7411-DSG7 vacuum lifter. The powerhouse, the Kombi 7441-DmS3H vacuum lifter with a hydraulic pivot system capable of swivelling weights of up to 1125 kg and also capable of moving curved panes of glass. Click here for more information about the Kombi 7441-DmS3H vacuum lifter. The elegant one, the Kombi 7211-ADS4Z vacuum lifter, capable of moving long, narrow and nonetheless heavy panes of glass safely, up to lengths of 6 metres. Click here for more information about the Kombi 7211-ADS4Z vacuum lifter. The beast of burden, the Kombi 7411-DS7Z vacuum lifter, the most powerful lifter in the range, with compact dimensions but with gigantic lifting power. This vacuum lifter can move weights of up to 750 kg. Click here for more information about the Kombi 7411-DS7Z vacuum lifter. The chameleon of the range, the Kombi 7211-DS250 vacuum lifter, for weights of up to 250 kg. Click here for more information about the Kombi 7211-DS250 vacuum lifter. The plate glass carriage 496-120-2, the plate glass transport carriage, not daunted by weights of up to 1000 kg. This plate glass carriage can be used for widths of glass measuring between 1.7 and 6.0 metres, while nonetheless able to fit into virtually any car. Click here for more information about plate glass carriage 496-120-2. The vacuum lifters for the production sector are also represented here, although this time they are in the minority. The small yet incredibly powerful MonoPort for lifting max. 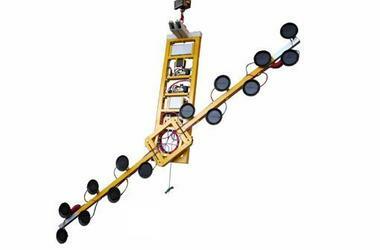 150 kg with a rotating capability can be viewed suspended from the hook of a crane. 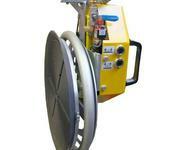 Click here for more information about vacuum lifter MonoPort - 7005-MD1/E. The 7025-MDS8/E vacuum lifter, the flexible unit, might shortly be moving glass and/or window pane weights on your premises that weigh up to 400 kg. This vacuum lifter can rotate and swivel the load pneumatically. Click here for more information about 7025-MDS8/E vacuum lifter. The DiPort vacuum lifter on the guided lifting column can turn weights of up to 200 kg pneumatically and complements the MonoPort. regrettably have to stay behind in Lübeck because we simply lack the space to exhibit them at the trade fair. Given the vast range of choice of vacuum lifters we field, it follows that only a small number can come to the trade fair. Anyway, come and pay us a visit at our stand D03 in Hall 12 and have a look at what we have brought along with us. You will see vacuum lifters of course, but also a big assortment of other things. Or the Corner Shoe (corner protection) ( 373 ), now available in thicknesses of up to 80 mm, to name but a few of the things we are bringing along to the trade fair. How do you make child's play of moving up to 1000 kg? Glaze heavy weights easily, safely and in a time-saving manner? Do you need a vacuum lifter that is easier to use, that holds heavy loads safely and, in doing so, is very flexible in size? Our newly revised Kombi 7211-DS3-2012 starts with a small base frame that can be extended using six extensions. And that is not all: with our vacuum lifter you can rapidly dismantle every single suction cup, even on the basis device.You would seek this kind of far-sightedness for a very long time in other vacuum lifters. Did you know as well that sometimes arms may be too short to release the levers for the locking units? For that eventuality, our vacuum lifters have a simple solution on board. That is because heavy panes of glass are usually quite large, and that is quite a useful factor. You are on the construction site and the battery is flat. Have you ever experienced something like that? That's where the real trouble usually tends to get started. How nice it would be to have a quick-change accumulator (rechargeable battery). These and similar considerations have prompted us to equip our Kombi 7211-DS3-2012 vacuum lifter accordingly with a quick-change system. Can you not also take a look into the future to know the tasks you will be required to perform? If ever work involving the movement of curved panes of glass arises, what do you do then? There is a conversion kit for the Kombi 7211-DS3-2012, enabling situations like that to be resolved. 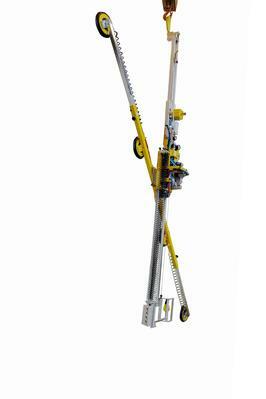 However, even inclined glazing or glazing under overhangs can be moved safely using the Kombi 7211-DS3-2012 vacuum lifter with an additional counterweight unit, the 'balance'. Just get in touch with us, and we shall work together to find you the optimum solution! That also appies if you are looking for an unusually flat vacuum lifter. Click here for more information about the Kombi 7211-DS3-2012 vacuum lifter. For decades, Pannkoke has been making the Corner Shoe. It protects fragile glass edges during transport and saves you no end of strife and stress. This little helper simply slides over the edge and is secured with a lever suction cup, at which point you have valuable protection for that fragile edge. This can also, to a certain extent, be used to support the glass pane along its edge. Now also available in an 80 mm width. With the MonoPort, this compact vacuum lifter, you can move 150 kg. 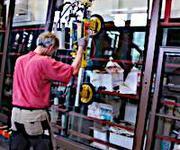 You can move panes of glass simply and quickly - and entirely without back pain. All you need is a crane or lightweight lifting tackle for the rigidly guided column. We can supply you with both versions, exactly as you wish. With the MonoPort you are not only able to lift panes of glass, but endless turning is also possible. The vacuum lifting device Kombi 7241-W600GG manufactured for GGR-UNIC in Great Britain is suitable for the transport of vertical elements. To enable the corner element to be transported in an upright position (i.e. vertically), a counterweight in the base frame is able to swivel out and deploy. The design rating for maximum weight of a corner element is 600 kg. Thanks to the 2-circuit technology employed for the vacuum lifter, it is suitable for work on EU construction sites. The rows of suction cups are designed to provide adjustable depth settings. Due to the swivel-deployable counterweight, the structural depth of the vacuum lifter is relatively small. This space-saving design delivers benefits when moving between frame and construction unit to installation location. There are many vacuum suction and pump suction grippers on the market. But you won't find one like the tried and tested 388 suction cup. Many customers who purchased the previous model, the 290 safety vacuum suction gripper, did not want to replace it by any other model and were dismayed to learn that we no longer produced their favourite gripper. Now it's back and this time the vacuum suction gripper is even available in two versions:a version with a centred handle for installation tasks anda version with an off-centre handle for carrying purposes. To meet your requirements even further, each version now comes with four different rubber compounds to suit your specific application. Glaze heavy weights easily, safely and time-saving? Do you need a suction lifter that is easier to use, that holds heavy loads safely and, in doing so, is very flexible in size? Should this vacuum lifter be at your disposal around the clock without interruption? Do you also want the option of moving curved materials around with it? Then inform yourself about our vacuum lifting device Kombi 7441-DmS3H, that you can use to move plates up to 1,125 kg in a safe manner. Information about the Kombi 7441-DmS3H pane lifter is only one click away. Video of the vacuum lifting device Kombi 7441-DmS3H being used on the construction site of "Moet et Chandon". How you can really be on the safe side. You are looking for a compact suction lifter that you can use to move heavy loads up to 750 kg? Should the vacuum lifting device be small in size? Do you also want to have a vacuum lifter that will allow you to work with almost no interruptions, in the same way as your cordless drill? Then our vacuum lifting device Kombi 7411-DS7 is the thing for you! Information about the Kombi 7411-DS7 pane lifter is only one click away. How can curved glass walls weighing 2000 kg be positioned with millimetric accuracy? A glass passage is being built between the town hall and the library in Manchester / England, something that you do not see every day. The passage does not have bearing pillars as construction elements, they are using glass elements. These curved glass elements each with lengths of approx. 7.5 m and a weight of upto 2,000 kg must be mounted between both parts of the building in a confined area, that was the drapht from Waagner Biro. Für diese Aufgabe haben wir den Vakuumheber Kombi 7411-DG6 entworfen. Gleichzeitig sollte dieser Saugheber auch zum Einsetzen von schmalen langen Streifen verwendet werden, deshalb verfügt das Gerät über einen Umsatzsatz mit dem Glasscheiben von minimal 500 mm und einer Länge von 7,5 m bewegt werden können. Die Gesamttiefe dieses Vakuumlifter beträgt gerade einmal 365 mm, um die 2.000 kg Glas mit einem Radius von 3500 mm vertikal zu bewegen. Die Drehbewegung der großen Glasscheiben erfolgt manuell. Für die nötige Sicherheit und ein schnelles Ansaugen der Glasscheibe sorgt die bewehrte 4-Kreis-Vakuumtechnik aus unserem Haus. Das Akku-Schnell-Wechsel-System stellt ein reibungsloses Arbeiten sicher, da es einen Stillstand, wegen leeren Akku, nicht kennt. Einfach den zweiten geladen Akku schnell in das Vakuumhebegerät einsetzen und weiter geht es. Do you remember the 50s, when men in dark overalls and flat caps took care of installing windows and occupational safety was the last thing on anyone’s mind? That was precisely when Pannkoke Flachglastechnik’s glass transport carrier, the 496, was introduced to the market. To this day, the carrier continues to be used at countless work sites. Admittedly, however, the requirements placed on this device and its use for moving large glass panes on rolling casters have since outgrown the confines of that long-gone decade. After all, 20-foot long glass panes with a weight of over 650 pounds are no longer a rarity these days! The needs of our customers and their projects played a central role when we at Pannkoke decided to reengineer our transport carrier. Our main goal was to create a wider support for glass panes, and we definitely met it with our 496-120 carrier, which is a good 120 mm (4.7 inches) wide, making it easy to move even entire prefabricated windows. We also made safety a key element in our engineering process, and used a tilt of 3° on our supports to provide a greater degree of stability, which has been further enhanced with a widened carrier mechanism. In order to make it easier to work with the device, we have added larger and wider wheels with ball bearings. This change not only makes it easier to negotiate small obstacles, but also minimizes the carrier’s ground contact pressure. In fact, even the steering articulations themselves are equipped with ball bearings! The carrier’s retainers for vacuum suction grips are yet another highly useful feature. Simply clamp them to exert a suction force on your window pane, making rough terrain easy to traverse without worrying. All these features enable our carrier to safely, reliably, and easily move a maximum weight of 1,650 pounds. And on top of that, when things get really tight, the carrier’s guiding handles can be folded in to get through narrow spaces easily. The carrier’s solid steel structure guarantees outstanding durability. It can be easily disassembled and can be transported in virtually any vehicle, none of which came at the expense of its enormous load capacity. And, of course, there is the question of price…… well, worry not: our class and style remain as affordable as ever! A small tool that should not be missing at any assembly company. It is also worth mentioning that a smaller version with a width of 90 mm (3.5 inches) is also available. In order to move the individual objects of the "Schattenlabyrinth" by artist Vera Röhm from Darmstadt (Germany - www.veraroehm.com), Pannkoke Flachglastechnik from Lübeck was allowed to develop and produce a very special kind of vacuum lifting device. 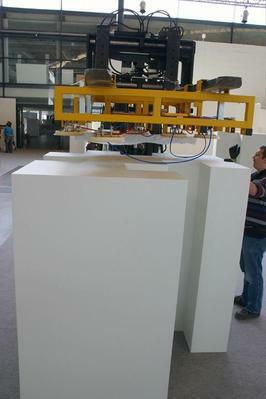 This device was first used during installation of the art fair "art" in Karlsruhe during March 2012. A 2-circle vacuum lifting device with which the art objects could be moved horizontally was developed for use with a fork stacker. The different forms with a center-to-center spacing of 340 mm resulted in 25 positions for the suction cups at the maximum outer dimension of 1700 mm. With the eight suction cups used, maximum transport weight was 400 kg. Special suction cups were employed to prevent any marks remaining on the art objects after transport. A stop rail and the fixed grid spacing of the individual suction cups made it easier to position the device. For easier handling, the vacuum lifting device was equipped with radio remote control for the functions SUCTION / RELEASE. On Tuesday we used the device at the art fair for the first time and took some photos; next Monday we are taking down the fair. Photos will be available next week. The device makes a very well-fabricated and sophisticated impression; it is very easy to handle and adapting it to the different forms. Transporting the objects was completely smooth and fast. And especially at an art fair, where many gallery owners and artists work in a rather improvised fashion, the construction garnered "envious glances". Until now sculptures have been moved with muscle power; the colleagues (and especially their spinal disks) were most content. We are going to number the suction cups and quick release couplings; previously in order to shut down one suction cup, one had to follow the hose through the construction. The idea with the stop rail was a great relief for the fork stacker driver. We masked off the rail with a foam pad and will permanently attach soft foam here, to prevent slight scratching to the painted surface of the objects during fine positioning with the side lift. One idea from our master carpenter was to make this stop rail removable; then he could also use the lifting device for his sheets of 40 mm MDF and other materials (these parts also weigh more than is healthy to lift). We have also covered pedastals with 250x200x40 cm 100 kg particle board; they can be moved. This is how ever-new tasks come to mind. Can our metalworker make this rail removable, or would we run into difficulties with the guarantee, UVV or the like? That's all for today; as said, photos next week. By the way, the next exhibition of "Schattenlabyrinth" is in Bad Ragaz in Switzerland. The lifting device will also be used again here. Over 55 years' experience in developing vacuum lifting devices at Pannkoke Flachglastechnik GmbH makes itself apparent, particularly in special task descriptions. At glasstec 2010, the RUCH Griesemer AG made a decision for the Kombi 7411-DS3. Because of its size adjustments, this device can be very flexibly deployed and in the process, is absolutely safe. The vacuum lifting device has four separate vacuum circuits. The greatest advantage of this device series is that if one vacuum circuit should fail, the three remaining independent vacuum circuits remain unaffected. Especially in the case of larger vacuum lifting devices, this brings enormous savings. First, the number of suction cups is minimized; second, suction time is shortened. The employees at Ruch Griesemer AG had recognised this and even during the trade fair, convinced their manager of the advantages of this device. Instead of size, the RUCH Griesemer AG places performance readiness and competence in the foreground.With their claim, to maintain precise craftsmanship and ally it with new high-tech products, they have secured a sustained market competence. In 2008, they were recognised with an award at the Central Switzerland Prize for Entrepreneurship. This device is optimally suited to their claim. 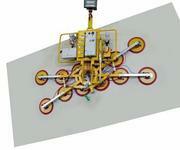 With a conversion kit for curved panes, this vacuum lifting device can lift almost anything up to a weight of 1200 kg. The six extensions make the device exceptionally flexible. With the toothed shaft cylinder and the favourably located point of rotation for tilting movements, even heavy glass panes can be easily tilted into the desired position. The 3° locking stops are ingeneous and safe. This makes a motorized drive superfluous. We are very content with your glass suction installation. The installation has not yet received a great deal of use, but as you can see from the photos, it is already quite spectacular. The toothed shaft for tilting the glass has already made our work easier several times and we are very pleased by the flexibility, for extremely large and heavy panes as well as for small." As ever, at Pannkoke progress begins in-house. As early as "glasstec 2000", we introduced the first 2-circuit vacuum lifting devices - to the jests of many. "Such a thing is completely unnecessary! "As of 01 January 2004, demand for this technology grew overnight. At glasstec 2010, we introduced numerous 4-circuit vacuum lifting devices. At Pannkoke, ever since 1956, you are always at the latest state of technology. Verres Industriels (also known by the name VIM), today AGC Verres Industriels S.A., in Moutier (Switzerland), is a company with a rich tradition. Now we have developed a new type of device for them, the manipulation device 7025-C-1000. For their production of safety glass, Verres Industriels needed a secure vacuum lifting device near the grinding machine to tilt (vertical to horizontal and vice versa) glass panes of up to 1000 kg. Especially for classes C and D of the laminated glass THRIGLAS, which are bullet- and even explosion-proof, small sizes are also characterised by extreme weights. The stable design and fast operating cycles of this development from Pannkoke received an enthusiastic response from the employees at Verres Industriels. The construction of this device type realises every requirement set by Verres Industriels. Their wish list was extensive and included a stable construction so the glass can be easily lowered onto the processing table. As well, the suction and release operations needed to take place quickly. So that small workpieces could also be moved with the device, each suction cup had to be individually lockable. Despite the heavy weights to be moved, the construction needed to be as compact as possible. Of course EU Safety Standard EN 13155 had to be complied with, because Verres Industriels places an extremely high value on safety. As with all devices from Pannkoke, before it was delivered this device also underwent a load test with twice the nominal load. The approximately 200 employees at Verres Industriels who are permitted to work with the device find the technology convincing and are enthusiastic about its use.The laminated glass THRIGLAS from Verres Industriels is used in transport vehicles for valuables and securities, just as in military and police vehicles, banks and even in the Popemobile. Vacuum lifting devices from Pannkoke stands for technology, that captivates. With our decades of experience in vacuum technology, we know what we do. If you are also looking for devices you can rely on, speak with us. We will also produce and deliver a device according to your desires. The Energy Glas GmbH Company, which was established in April 2008, specialises in the production of three-fold energy-saving insulation glass panes up to a size of 6.0 x 3.2 m. Investments in appropriate machinery with numerous special requirements were necessary for this modern production site in Wolfhagen. The Energy Glas GmbH Company has an ISOLAR product licence and therefore a product range of the most modern insulation and functional insulating glass panes at its disposal. The main focus of the enterprise is the production of three-fold energy saving insulation glass. Up to 2500 m² insulation glass is manufactured daily on two insulation glass lines. The glass panes are delivered throughout Germany and to the neighbouring countries with its own vehicle fleet or forwarding businesses. The maximum glass pane size of 6.0 x 3.2 m is a special challenge, because the individual insulation glass panes can already weigh more than 2000 kg. This weight places special requirements not only on the supply of the insulation glass line but also on removal and further transport of these large glass panes. The maximum construction depth of such a three-fold insulation glass pane can even achieve 100 mm. It was at the Pannkoke Flachglastechnik GmbH (http://www.pannkoke.de/) from Lübeck that the Energy Glas GmbH Company found the required vacuum lifting device. The new model series of manipulation devices of the Lübeck specialists does not offer anything particularly new at first sight. Only when using the devices does the operator recognize the many small improvements in comparison to the earlier solutions. The safety standard EN 13155 is complied with due to the closed vacuum circuit and the associated monitoring systems. 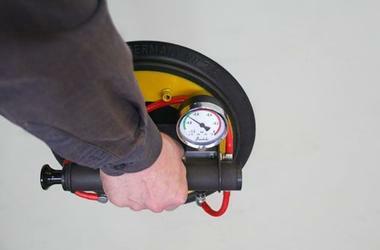 A control vacuum meter displays the work and danger area of the vacuum in various colours. A vacuum sensor with an acoustic warning signal is additionally integrated, which warns of a too low vacuum. A compressed air monitoring system is installed with another acoustic signal, in order to monitor failure of the power supply. Operation is carried out by means of the guide handle of the device. The two-function release device can be operated with one hand. It is possible to transport the panes nearly vertically due to the special selection of the point of suspension. The manipulation device 7025-MD4-2/E is used for supply of and removal from the smaller insulation glass unit. This device is equipped with two suction cups and can turn glass pane weights up to 200 kg by 90 degrees. The manipulation device 7025-MD4/E , which can turn glass panes up to 500 kg, is used for supply to and removal from the larger insulation glass line. The device can be equipped with extensions for large glass pane areas, which provides for larger area stability and increased safety. The manipulation device 7025-MS4/E is available at the integrated manual sealing stretch for special insulation glass panes, in order to move the insulation glass panes from the sealing table to the racks. Glass pane weights up to 500 kg can be swivelled with this device. This manipulation device can also be equipped with additional extensions. The Venturi device 7005-AB is used to supply the insulation glass unit with large glass panes; the device is used otherwise in the manual cutting unit for feeding the cutting table with glass. Depending upon design, this type of device can transport up to 1200 kg and sized up to 6.0 x 3.2 m. The extendable side tubes help when adapting to the glass dimensions. If required, these support tubes can also manufactured in such a way that they can be removed. 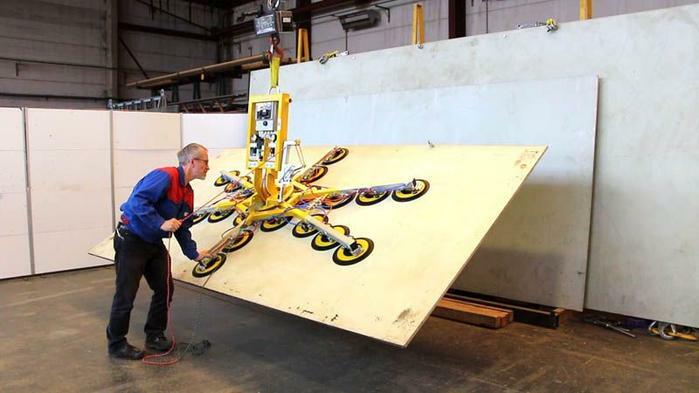 A mobile trestle system developed by the Energy Glas Company is used to remove these large glass panes. Unfortunately, application of the insulating glass off-loading frame is not possible directly on the insulation glass line for constructional reasons. 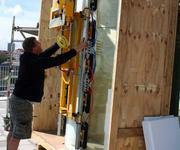 The new version of the well-known insulating glass off-loading frame is used to move the large glass panes. Such a 2000 kg heavy insulation glass pane on the special glass trestle can be lifted by means of the additional suction cups and adjustable crane eye from the front and set down from the rear side. This enables positioning the insulation glass panes on the required glass side, so that the insulation glass pane can be delivered on the rack. Mr. Dohmann of Energy Glas is extremely enthusiastic about the co-operation, the supplied vacuum lifting devices as well as the realisation of his ideas concerning the Insulating glass off-loading frame. The Glas Schuler Company required a flexible vacuum lifting device for turning and tilting glass pane weights up to 500 kg, in order to achieve a more rational production of isolettes, an insulating glass pane with built in jalousie. The Glas Schuler Company (http://www.isolette.de/) has been already occupied for over 325 years with the manufacture of glass, to be more precise since the year 1679. At the beginning of the 70's, production of insulated glass panes was taken up and the first isolette was manufactured just 20 years ago. This is an insulated glass pane with a controllable jalousie built in between the panes, thereby enabling control of the light in the room. Today fourth generation isolettes are manufactured. An isolette is equipped with an electronically controlled electric motor, which is bus-compatible and can be externally programmed. The room lighting of complete faces of a building can be thereby controlled, e.g. via sunlight sensors and / or internal light sensors. There are several licensees for this technology world-wide. The isolettes are sealed manually and must be moved from the horizontal sealing table vertically onto the transport carts or transport racks. The maximum size of isolettes manufactured by Glas Schuler is 2.6 x 3.0 m. Hand made custom versions are also possible up to a height of 4 m. The isolettes are turned in such a way that the internally built in jalousie is always the bearing area for transport to the customer. This ensures that the built mechanical system is hardly strained during transport. For this reason not only the powerful swivelling movement but also the rotary motion was an important criterion for the vacuum lifting device. The device should be easily adaptable to the different dimensions due to the different sizes of the isolettes. It was at Pannkoke Flach­glastechnik GmbH (http://www.pannkoke.de/) from Lübeck that the Glas Schuler Company found the required vacuum lifting device, i.e. the manipulation device 7025‑MDmS4/E. The small frame with the four suction caps enables moving small panes and the four extensions, which can be mounted at six possible positions of the basic frame, also enables moving larger panes easily and safely. In order to achieve the best solution for the space conditions and to thereby be able to produce the isolette rationally, the correct lightweight crane was used in the Glas Schuler facory apart from the optimal vacuum lifting device. This investment has already paid off for Mr. Schuler, since the work can now be carried out by only one employee and much faster. A major German furniture company has found a new look for its outlets! Including an extensive and colored overhead glass curtain wall. 5000m² colored laminated glass panes per construction object will be mounted into the steal curtain wall, that is tilted outward. The SL-2ESG-VSG pane is produced by Steindl of Itter, Austria and is 5950 mm x 2500 mm large. The pane will be glazed by the company Kuball Glaserei und Glashandel GmbH of Hamburg. Kuball will use Pannhoke Flachglastechnik GmbH of Lübeck's know-how to select the right devices for the project. However, instead of a simple vacuum lifting device, the company wants a multi-use device for the task, such as the battery-operated vacuum lifting device Kombi 7211-DS3. The Kombi 7211-DS3 vacuum device can turn up to 1000kg up to +/- 360° and tilt up to an angle of 90°. Although the vacuum lifting device is designed for 1000kg, it has a very flat structure, which is well-suited for glazing between scaffolding and the structure. The six extensions enable an individual adjustment to the demands at the construction site. The vacuum lifting device naturally meets the standard requirements of EN 13155. One of the major challenges of standard EN 13155 is the redundant vacuum system for vacuum lifting devices, meaning a vacuum lifting device with two independent vacuum circuits and corresponding monitoring function for the vacuum. Each vacuum circuit must be capable of maintaining the nominal load with a safety factor of 2. Not many manufacturers create 2-circuit devices that meet these requirements. Pannkoke Flachglastechnik GmbH of Lübeck (http://www.pannkoke.de/) is one of the manufacturers who does offer such a vacuum lifting device and has studied the issue of "redundant vacuum lifting devices" from early on. The combination with the counterweight unit Balance5 enables the vacuum lifting device to handle the outward-tilted steel curtain walling. The Balance counterweight unit has been used many times, and in this combination becomes a form of universal device that can be used for almost any problem at a construction site. The Balance counterweight unit has a non-fixed counterweight. To ensure the device is suitable for a construction site, the moving motion is controlled by a battery-operated DC drive. The drive is equipped with a speed control mechanism for micro-controlling the inclination movement and can also be set from a operating switch. The work was greatly simplified by the micro-level setting of the inclination angle and the non-fixed counterweight. This also minimized the safety risk and enabled the glazing to be accomplished quickly. Thanks to the great solution by Pannkoke, Kuball was able to maintain the tight schedule with minimum personnel. The investment in the new device technology from Pannkoke Flachglastechnik GmbH is another important step toward ensuring the future of their company for Kuball, the specialist company from Hamburg. What is the easy way for a user to become a producer? The unauthorised replacement of parts and machinery conversions may have far-reaching consequences. It's a common problem. The pressure of rising costs is felt everywhere. People are saving wherever they can. However, the consequences of saving when it comes to machinery safety and guaranteed machine characteristics quickly results in far-reaching consequences within the EU. This point is quickly reached with vacuum lifting devices. This is because, although suction cups on the market look almost the same, at least externally, and may have the same geometric dimensions, they may not necessarily have the same load-carrying capacity. Tests performed at the University of Kiel in the past few years show that they may be deviations of 25% given the same geometric dimensions. This fact shows that the load-carrying capacity of a vacuum lifting device may be reduced by a quarter by simply replacing the suction cups. This represents a considerable change in device characteristics. Anyone who makes a modification of this kind becomes a producer and must therefore go through all the steps to obtain the necessary CE mark himself. This starts with the nameplate and risk analysis through to producing the operating instructions. Only when all these steps have been completed may the device bear a CE mark again and be operated within the EU. If these steps are not complied with, an unsafe vacuum lifting device will be in operation within the EU with all its consequences. In other words, the penalty to pay in the event of an accident is for gross negligence. The managing director or business owner should therefore seek advice on this matter from a competent authority. there should be no unauthorised tampering with device characteristics. Any changes should be left to the specialist manufacturer of the vacuum lifting device. If you contract the conversion of a vacuum lifting device to an outside company, you must make it a rule to check whether the main characteristics, especially safety-related features, have been changed. If they have, the converting company becomes a producer of the vacuum lifting device. It is then necessary to deliver the vacuum lifting device with a new nameplate, a new Declaration of Conformity, a CE mark and the operating instructions. If this fails to happen, it makes the body of evidence regarding whether the device used is a safe vacuum lifting device, more difficult in the event of damage. This is because the operator is also responsible for device safety in the EU. We would like to illustrate this problem by means of a vacuum lifting device returned to us. The original product made by Pannkoke Flachglastechnik GmbH, a Kombi 7011-DS, was brought into circulation in 2000. At that time, as usual, it was a vacuum lifting device with a single vacuum circuit. It was equipped with 6 388-type suction cups and was capable of holding 600 kg with double safety in the load test, i.e. 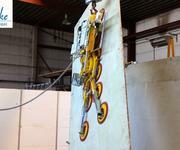 the device could lift a total load of 1200 kg without the load slipping. As required, a vacuum tank with non-return valve was provided. The charger, rechargeable battery and the entire control system comprising the indicators were housed in the switch box. A visual and acoustic alert signal was activated if the vacuum dropped below a certain level. This vacuum lifting device was converted into a 2-circuit system by an outside company. It was supposed to comply with safety standard EN 13155, as stated on the sticker affixed to the device. The control system was removed from the original vacuum lifting device, the vacuum cups were replaced and everything was changed except for the original steel frame, i.e. the device was totally new with a completely different operation and function. Prescribed vacuum tanks are difficult to find, and whether a commercially available charger behind a Plexiglas cover provides the user with the required safety is not the subject of discussion here. 1200 kg : 3 = 400 kg (vertically)? Why 1200 kg? Because 3 suction cups are assigned to one vacuum circuit and double safety is a requirement here. The suction cup diameter is 350 mm, producing a surface area of 962 cm². The working range of the device starts with a vacuum of -0.6 bar. At a coefficient of friction of 0.5, the suction cup has a load-bearing capacity of 288.6 kg. For three suction cups, this is therefore 865.8 kg, not 1200 kg. The coefficient of friction is given in the literature as 0.5 and is not the invention of Pannkoke. This calculation was verified in a load test. The result with new suction cups is better than the calculated value, but the required 400 kg were not achieved. Apart from the question of the load-bearing capacity of the suction cups used and the lack of vacuum tank, the new producer of the vacuum lifting device failed to supply the converted device with operating instructions or with a nameplate, and therefore there is no valid CE mark. In our example, the converted vacuum lifting device was supplied to the operator with the original operating instructions of Pannkoke Flachglastechnik GmbH and a supplementary document stating only that the vacuum lifting device had been converted. There was no further information. No matter what the function of the vacuum lifting device is, the vacuum lifting device must be classified as unsafe since the operating instructions are missing. Not to mention the highly reduced load-bearing capacity of the suction cups used. Whoever uses such a converted device is acting with gross negligence in terms of the law. If we convert a 1-circuit vacuum lifting unit which we manufactured into a 2-circuit device, it receives a maximum of 8 suction cups and the load-bearing capacity is lowered to 400 kg on construction sites. Prior to any conversion, the device is subjected to a thorough test. After conversion, the vacuum lifting device is returned to the test stand and each vacuum circuit must be capable of bearing double the rated load in the form of steel plates. The safety standard EN 13155 has been in effect since January 1, 2004 and represents the current state of the art as well as the minimum requirements. Whatever the solution, it must offer the necessary safety of a device with at least two vacuum circuits when used on construction sites. It is also important for each vacuum circuit to be capable of achieving a rated load at twice the safety. The standardisation committee assumes that a vacuum circuit could fail and the other vacuum circuit should then be capable of holding the load safely. Irrespective of the fact that a conversion is performed correctly or incorrectly, it causes a significant change in device characteristics since the operation, safety facilities and much more no longer correspond to the original device. In practice, a new device has been produced and this requires compliance with all the steps leading to CE conformity. Please verify your deliveries, since you as operator are obliged to make sure that the devices you put into operation are safe and meet the statutory regulations. The testing of vacuum lifting devices also belongs to the competence of specialists who deal with vacuum lifting devices on a daily basis and who know the requirements regarding vacuum lifting device. The stamp of a crane company may be cheaper but has little to do with the concept of safety. The device in our example was also tested by a crane service and was found to be in order. As we have shown, this is not the case. It is a matter of safety, the safety of your employees and all others who are located on and around the construction site. For this reason, we always subject the suction cups to load-bearing capacity tests during inspections. You can only obtain this degree of safety from a specialist since it is impossible to judge the actual load-bearing capacity by just looking at a suction cup. The company Glas Zange (http://glas-zange.de/) was faced with the demanding challenge of implementing modern architecture, which involved mounting a total of 40 sheets of shaped 12 mm laminated safety glass on an office building in Munich. These convex and concave shaped laminated safety glass sheets still had, in part, straight run-out ends with a length of up to 1200 mm. The radii range between 720 and 1890 mm. The heaviest sheets weigh 300 kg with a height measuring 3030 mm. The curved laminated safety glass sheets are produced by Franz Döring GmbH & Co. KG (http://www.doeringglas.de/) based in Berlin, Germany. During the early stages of this construction project, the Weiden-based glass specialist, Glas Zange, did not have available a suitable vacuum lifting device for this task. The company therefore turned to Pannkoke Flachglastechnik GmbH with its problem and added a vacuum lifting device, the Kombi 7211-CeDeG, to its range of machinery. The Kombi 7211-DS3 supplied by Pannkoke was used effectively to quickly mount the remaining 1800 m² of Sanco insulation glass sheeting and 2000 m² of supplementary sheeting made from laminated safety glass 12. Vacuum handling equipment conforming to the safety standard EN 13155 is required for glazing applications on construction sites within the EU. 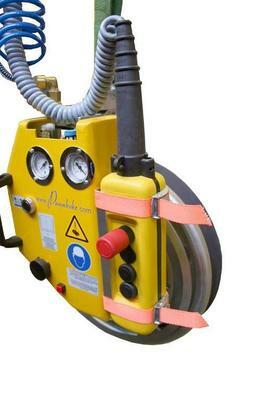 The vacuum lifting device supplied by Pannkoke meets these demanding requirements down to last detail. One of the main requirements of the standard EN 13155 governing vacuum lifting devices used on construction sites is the provision of a backup vacuum system with corresponding monitoring functions. Each vacuum circuit must be capable of maintaining the nominal load with a safety factor of 2. Not all 2-circuit devices available on the market can satisfy this elementary requirement. Illustrating this point based on this vacuum lifting device: For a maximum load bearing capacity of 300 kg, the device must be capable of holding this load with a safety factor of 2 in the event of one of the vacuum circuits failing. In the case of the Kombi 7211-CeDeG, one vacuum circuit alone must be capable of holding 600 kg. Pannkoke Flachglastechnik GmbH is a manufacturer who offers such vacuum handling equipment and has perfected its range of vacuum lifting devices with a backup vacuum system. Complying with the safety standard EN 13155 proves to be particularly problematic when handling curved glass sheets. Conforming to the required degree of safety is not a straightforward task, as it is necessary to adapt the suction cups to the radius while at the same time doubling the number of required suction cups. In connection with heavy weights, this can be achieved only by the use of more intricate vacuum technology, involving 4 independent vacuum circuits. Pannkoke, the Luebeck-based specialist offers effective solutions also to this problem, making full use of the 50 years of experience gained in the manufacture of vacuum handling equipment and lifting devices. The vacuum lifting device, the battery-powered Kombi 7211-CeDeG, ordered from Pannkoke by the company Glas Zange provides the option of turning through +/-90° and is designed to a maximum load bearing capacity of 300 kg. The two rows of suction cups can be adjusted to radii of 710 mm through to flat surfaces. The suction cups are designed in such a way that they can be individually locked in position, thus making them much easier to adjust and check. The crane eye is also designed such that it is adjustable to ensure perfect alignment of the glass sheet. The special actuation system for the solenoid valves conserves power, thus helping to achieve optimum battery runtime. The entire control configuration, including the battery charger, is housed in a sturdy steel enclosure. Since Glas Zange attaches the utmost importance to safety, only safe and reliable vacuum lifting devices are used. The range of machinery operated by the company Glas Zange already includes a large selection of 2-circuit vacuum lifting devices supplied by Pannkoke such as the Kombi 7211-VT, Kombi 7211-CeDe with the counterweight unit Balance, the Kombi 7211-DS3 and now the Kombi 7211-CeDeG. For Glas Zange, the decision to invest in the new equipment technology will ensure its effectiveness in future applications. The "Montage van der Linde b.v." from Leimuiden, Netherlands ( http://www.montagevdlinde.nl/ ), specialist for difficult glazing applications, had the task of glazing a round arch for the Nieuwbouw Chinees Zakenhotel in Delft. Panel dimensions 2380 x 680 mm with a radius of 3900 mm to 2380 x 3740 mm and a radius of 4190 mm, maximum weight 490 kg. The machinery was not yet ready to meet this challenge, although several vacuum lifting devices from Pannkoke Flachglastechnik GmbH, Lübeck, Germany were available. In addition the intention was to purchase a vacuum lifting device for higher weights and dimensions that is capable of turning and tilting the glass panels. In accordance with the specified customer requirements, Pannkoke Flachglastechnik GmbH developed from its standard programme the battery -operated device KOMBI 7211-DSG3 with special conversion kits for curved panels up to a weight of 500 kg. The device was equipped with several special conversion kits, as it was intended to enable the small and large panels to be turned by max. +/- 360° and tilted by max. 90°. Conversion of the device is quickly and easily possible back to the standard device KOMBI 7211-DS3 and can then be safely and without problems used for turning and tilting of flat insulating glass panels up to a weight of 1000 kg. The special feature of the KOMBI 7211-DS3 is the particularly low structural depth of the device, this being only 210 mm. Due to its maximum of six extensions, it offers the possibility of individual adaptation to on-site challenges. The curved special insulating glass panels for glazing came from the production of the "Franz Döring GmbH & Co. KG" Company (http://www.doeringglas.de/) from Berlin, Germany. "Franz Döring GmbH & Co. KG" also uses a multitude of various Pannkoke vacuum lifting devices in production. A particularly high degree of safety requirements is demanded for glazing work on EU building sites according to EU standard EN 13155. This was an important and decisive aspect for Henk-Jan van der Linde in making his decision on acquiring the new device. An important requirement of standard EN 13155 is a redundant vacuum system for vacuum lifting devices, meaning a vacuum lifting device with two independent vacuum circuits and corresponding vacuum monitoring functions. Each vacuum circuit must be capable of holding the rated load with double security. 2-circuit devices, which actually and reliably meet these requirements are only offered by a handful of manufacturers. Pannkoke Flachglastechnik GmbH from Lübeck in Germany is one of the manufacturers offering such vacuum lifting devices and who has from an early stage intensively been involved in the topic of "redundant vacuum lifting devices". This is why Henk-Jan van der Linde personally picked up the vacuum lifting device manufactured for him in Lübeck and took the time for a practical on-site demonstration and explanation with the corresponding required load values. The version of the KOMBI 7211-DS3 with all six extensions and a total of 20 suctions cups can transport 1000 kg with double security. This means that each vacuum circuit must be able to carry 2000 kg. And that was what convinced Henk-Jan van der Linde in Lübeck during testing. The staff of "Montage van der Linde b.v." from Leimuiden, Netherlands, quickly, easily and effectively glazed the facade of the Nieuwbouw Chinees Zakenhotel in Delft. First of all, each insulating glass panel was sucked on by the inner side and taken out of the box. Then the device was changed to the front side of the glass panel. This was no problem for the experienced staff team and the device supplied by Pannkoke Flachglastechnik.GmbH, Lübeck using the assembly lift and crane of "Montage van der Linde b.v.". The stated device characteristics played an important role in order placing. The investment in a new device technology from Pannkoke Flachglastechnik GmbH is another important step to securing the future for Henk-Jan van der Linde and his glazing specialists. The manufacturer of large insulated glass panes (www.henzeglas.de) from Hörden in the Harz region of Germany ensured that the Pforzheim Jewellery Museum opened on time. The Reuchlin house in the municipal garden was built between 1957 and 1961. It has been home to the Jewellery Museum, the Art and Art Industry Association of Pforzheim and the Reuchlin Research Centre since 1994. It is one of the noteworthy national achievements of the post-war modern age. In the 1950s, the architect, Manfred Lembruck, won the competitive tender for the construction of this house that was named after the humanist Johannes Reuchlin (1455-1522) who is considered one of the most important people to be born in Pforzheim. One of the panes was broken by having a stone thrown at it, and was to be replaced with several smaller panes. The pioneer of large glass pane specialists, Dietmar Henze, was able to convince the mayor of Pforzheim, Alexander Uhlig, to choose to keep the original appearance and not to go for a break up of the glass surface. The slight change regarding the replacement of the glass concerns the use of an insulated glass pane, in keeping with the times. In 2005, the year of the company anniversary, Dietmar Henze exhibited his symbol in a huge production hall to demonstrate that a new era had been entered in the manufacture of insulated glass panes. Two 9 x 3 m large insulated panes were set up there to demonstrate the size at close quarters. Henze Glas was responsible for the construction and installation of this large pane of insulated glass, measuring 8.91 x 2.95 m with double 10 mm float glass and weighing 1300 kg. The large panes were cut by Henze Glas in their workshop in Hörden and put together as insulated glass on the Lenhardt insulated glass line. 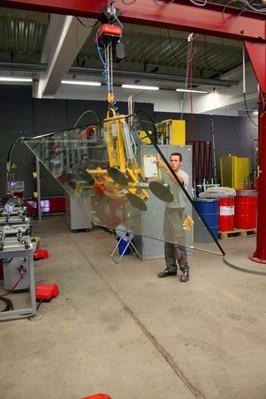 The safe handling of the large pane took place in the company with a unique, special large pane vacuum machine by the Lübeck based company, specialising in vacuum machines, Pannkoke Flachglastechnik GmbH, especially developed for such an application in accordance with EU safety standard EN 13155. Under the watchful eyes of the head of the firm and initiator of this project, Dietmar Henze, the huge float glass sheets swung sheet by sheet onto the special-purpose vehicle provided by Henze Glas, suspended from our vacuum lifting device. Henze Glas had already invested early on in the manufacture and handling of such large format panes, transformed its ideas for transportation into a suitable specially adapted vehicle, and presented the requirements to the supplier for the vacuum machine. The very high safety standards for Henze Glas always take the top priority. There was therefore no compromise so an investment was made in a two circuit vacuum machine straight away in accordance with safety standard EN 13155. Pannkoke is making its Kombi 7201-CeDe according to the individual wishes of the Henze Company. With the Henze Glas special transport vehicle, the enormous insulated glass pane was transported to Pforzheim where it was guided precisely by remote control with an automatic crane and thanks to the Pannkoke special vacuum machine Kombi 7201 CeDe to the inner courtyard of the building where it was secured into place in the open building structure. After 2 hours, the heavy assembly work had been completed with the help of 15 employees. Despite driving snow and cold, the Henze Glas specialist managed to execute this task on time with a large press and public attendance. The owner Dietmar Henze could therefore notch up another milestone in the large glass pane business. 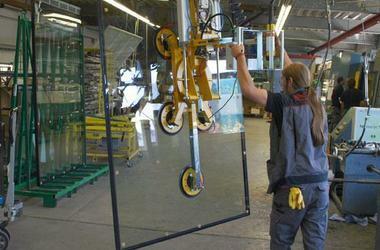 Production of the insulated glass pane on a Lenhardt production line. Mr. Henze would like to point out clearly that he only works with equipment from reliable partners, such as Pannkoke Flachglastechnik GmbH when dealing with any work requiring high safety standards. Architects and building owners are always making new demands on the glass processors. Large size sheets above the standard float glass measurement of 3,21 x 6,0 m are possible nowadays. 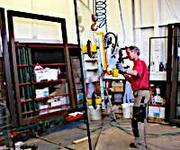 And the glass processor cannot be surprised when even multiple laminated safety glass sheets having these measurements. We have long taken up the challenge of transporting and handling these giant sheets. High carrying capacities are required on the insulation line as well as during cutting or while using the diamond saw. What is the obvious thing to do when you know you need help to find specialized solutions for dealing with such giant sheets? A market leader for large sheets, the company Henze Glas (www.henzeglas.de), from Hoerden/Harz in Germany, knew just what to do. Henze Glas has been buying machines and devices with complete confidence from us for 30 years. Henze Glas has always been an innovative glass processer and had early on recognized the trend for large-sized sheets, investing in machines in the field of cutting and sealing in order to produce large-sized sheets. For the handling of these sheets – we as his partner have been in overall charge. Sheets with a weight of nearly 2000 kg had to be handled and moved. A multiple-connection device was needed for transporting/turning from the vertical for sawing in the horizontal positions. The complete units had to also be able to be turned, if necessary, so that an up-end glazing on the construction site could be possible. 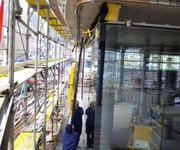 Glazing at site with turning of a 1800 kg insulating unit of laminated alabaster glass. We delivered a vacuum lifting device (Kombi 7201-CeDe) for sheets of 1800 kg. This lifting device is able to turn and can be retrofitted to horizontal operation. Henze Glas now works with this device which is equipped with the latest 2-circuit-system safety technology . Not only were the requirements fulfilled but also the corresponding carrying capacity was guaranteed in case of a failure of the system. Even when the needs of the customers require being able to handle ever increasing weights, we always fully check each device on operating conditions in the overload capacity before delivery. Dietmar Henze hasn’t reached the end of his entrepreneurial endeavors with this latest development. We can look forward with anticipation to the next task he tackles in collaboration with our technicians. Mr Henze likes to give his collegues the tip that when they need such safety relevant devices, they can’t do better than to work together with a reliable partner. We take this message to heart and stand always ready to take on further challenges. How do you transport window parts with inbuilt blinds that weigh a maximum of 700 kg fast and easily? For the new internal medicine building of the clinic of the University of Würburg, the company IGM from Medard got the task of delivering the facade elements. The full, pre-assembled, glazed window parts with a measuring up to 7.0 x 2.5 m are fitted with electric shutters. December 2005 was half-time for the largest state tall building in Bavaria to date. 2002 began with the excavation of the site for the internal medicine centre (ZIM). The shell of the building was started in 2004 and construction will be completed in 2006. When the building has been completed, it can start to be used from the end of 2008. The building to be erected covers around 23.000 m² of usable area on a total area of 62.000 m². In total, a building complex of around 280.000 m³ with 301 beds will be built. For this large task, the company IGM from Medard changed its work somewhat and built a new horizontal production line. The elements must be taken from the end of the production line and transported to storage. As soon as the part delivery can take place, the lorries must be loaded up. For these special tasks, the company Pannkoke Flachglastechnick GmbH from Lübeck was given the task of delivering the corresponding vacuum lifting device. Pannkoke Flachglastechnik GmbH from Lübeck examined all the drawings submitted and produced a vacuum device for this purpose. Client specific solutions are not only the way to go on the building site; they pay for themselves quickly in production too. The Lübeck based company promptly delivered a practicable solution for the various window elements that complied with the EN 13155 safety standard. The specially chosen suspension point means that it is possible to transport the elements almost vertically. This was made a little more difficult by the roller shutters, but the solution won the client over. With the Kombi 7001-AB SO, the elements could be moved quickly and safely without any large change costs. It was the correct decision for IGM to give the task to a specialist in order to guarantee a smooth in-house work flow. The Dresden central railway station is to be renovated in the design of Sir Norman Foster as almost the last large German railway stations of Deutsche Bahn AG. Although the area above the platforms contains a new extremely tear-proof membrane roof (Teflon roof made from fibreglass) instead of a glass roof, a part of the roof in the station concourse is made of glass. Insulating panes of glass of 4.47 x 2.00 m from ESG12 with L7R16 and VSG ZO TUG glass protection with screen prints, weighing around 700 kg and 48 mm thick had to be assembled in the station concourse. 90 of these large glass panes had to be produced and then installed. The specialist company Glas Zange (http://glas-zange.de/) from Weiden has the necessary technical knowledge and the required stock of machinery to produce the insulating glass of 6 m x 3.21 m.
Even unusual requirements do not present a problem for this specialist. For this work, the building trade association, Bayern & Sachsen, Germany required a vacuum lifting device that meets the EU standard EN 13155. 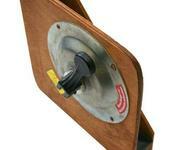 An essential requirement of the standard EN 13155 is a redundant vacuum system for vacuum lifting equipment, i.e. a vacuum lifting device with two independent vacuum circuits and the associated functionality to control the vacuum. Each vacuum circuit must be able to support twice the nominal load easily. Only a handful of manufacturers are able to offer 2- circuit devices that can meet these requirements. Pannkoke Flachglastechnik GmbH is one the manufacturers to offer such vacuum lifting devices and completely got to grips with the issue of "redundant vacuum-lifting devices" early on. For the glazing to the roof of Dresden's main station and for other projects, Glas Zange extended the machinery required for such glazing work to include the battery-powered vacuum lifting device KOMBI 7211-DS3. The battery-powered vacuum lifting device KOMBI 7211-DS3 with a maximum load bearing capacity of 1000 kg was ordered to turn through +/-360° and to pivot through 90°. The device is built very flat for the considerable weight of the panes. Six extensions made it possible to adapt the tool specifically to the challenges of the building. The device's properties played a decisive role in awarding the contract. The experienced staff from Glas Zange in Weiden was able to glaze the roof of Dresden's main station quickly, easily and effectively. The actual glazing of a glass pane only took around 10 minutes. Besides the battery-powered vacuum lifting device KOMBI 7211-DS3 there was a construction site crane available for this work. Thanks to the technically sound solution offered by the pivot mechanism, it was possible to manoeuvre the large panes easily from a vertical position into the required slope of the roof. The possibility of being able to stop the pane every 3° with the locking mechanism eased glazing specialists' work considerably. The investment in the new equipment technology from Pannkoke Flachglastechnik GmbH is for the Weiden specialists a further important step towards securing their future. How can you place window elements with integrated blinds and a dead weight of 700kg under a 2.0 meter deep roof? The company IGM assumed this challenge for the new buildings being constructured for the department of internal medicine at the University of Würzburg's clinic. IGM had to rationally and safely integrate completely pre-assembled and glazed window elements with dimensions 7.0m x 2.5m and equipped with electric blinds into the structure. IGM, located in Medard, (www.igm-gmbh.de) had to safely transport the elements through the construction site, sometimes for longer distances. Even two inner courtyards had to be equipped with window elements. IGM selected Pannkoke Flachglastechik GmbH in Lübeck as their contract partner for an assembly lifting device. IGM's decision to make Pannkoke Flachglastechnik GmbH their partner (http://www.pannkoke.de/) was the right decision and ensured that they had the right equipment for the job. As is frequently the case, the problem of transportation was not considered until right before the construction was planned to begin. Lübeck was able to quickly provide a solution for the different window elements while adhering to the safety standards of EN 13155 that apply to construction sites. The initial plan only included one roofing element of approximately 05 meters. The vacuum lifting device "Balance 2KS" has a non-fixed counterweight. To ensure that the device was suitable for a construction site, the moving motion was done using a battery-operated DC drive. To micro-control the inclination movement, the drive was equipped with a speel control mechanism that could also be controlled from an operating switch. The vacuum generator used a separate battery-operated vacuum unit with 2-circuit technology, i.e. the vacuum unit had two independent vacuum circuits. This concept allowed a quick adjustment to the new conditions and also allowed a vacuum unit to be used for other cases. The redundant vacuum system (2-circuit system) ensures the device safety in case one of the vacuum circles becomes untight. In this case, the other vacuum circuit would still ensure the normal load, since safety standard EN 13155 for construction sites requires each vacuum circuit be able to safely carry the normal load with a safety factor of 2. Each vacuum circuit has a separate control vacuum meter and a separate vacuum monitor. If the vacuum of a vacuum circuit falls below the standard, an optic and accoustic warning system alerts the operator of the situation. The micro-level settings of the inclination angle with a non-fixed counterweight made the work much easier, minimized the safety risk and enabled the glazing to be accomplished quickly. The company Koenig Glasbau GmbH & Co KG in Helmstedt (http://www.glasbau-koenig.de/) is one of the first customers to use the battery operated, completely redesigned vacuum lifting device Kombi 7211-DS3. This vacuum lifting device, manufactured by us and presented for the first time at the glasstec 2004, offers versatile on-site uses. The new, extremely flat Kombi 7211-DS3 simplifies glazing between façade and scaffolding and consequently renders work a lot more efficient. Thanks to this new device, the company Koenig was able to carry out its glazing work in a fast and simple manner. As a result of the many variation possibilities offered by the Kombi 7211-DS3 and its maximum carrying capacity of 1000 kg during on-site operation (pursuant to EU standard EN 13155), there is a solution for virtually every task in the field of glazing. By means of the 2-circuit rotary transmission leadthrough it is possible to infinitely rotate the glass pane. The tilting motion (vertical – horizontal) can be carried out by very small degrees. For this reason, this completely redesigned mechanism permits both a simple and safe tilting to the desired position. Within minutes, the mechanical tilting device can be exchanged against a hydraulic tilting device. In addition, a model with electrical swivelling device is also available. Although compared to previous battery operated vacuum lifting devices, the battery capacity has been almost doubled, it has all the same been possible to reduce the device depth to 230 mm and this at a maximum carrying capacity of 1000 kg. 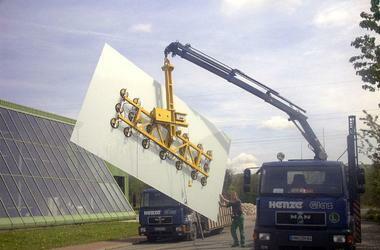 With the aid of six extensions, the suction frame can be adapted to the goods to be transported. Without extension, the Kombi 7211-DS3 ’s base frame can be equipped with a maximum of 8 suction cups. This consequently results in a load-bearing capacity of 400 kg per vacuum circuit. Through the additional extensions, the number of suction cups can be gradually increased to 20 (10 suction cups per vacuum circuit). This “growing” of the Kombi 7211-DS3 along with its tasks is unique on the vacuum lifting device market, which currently offers no other device of equal adaptability. The device’s suspension point has been brought that close to the loaded device’s centre of gravity, that the loaded device’s angle of inclination is very small, i.e. almost vertical, even at 1000 kg. This is very important when working between scaffolding and house wall. To be able to carry out glazing work underneath projecting structures or overhangs, the Kombi 7211-DS3 is designed such that it can be used with the counter weight unit Balance without a problem. Only the sophisticated design of the device makes it possible to work with 1000 kg glass panes underneath an overhang of max. 1.5 m or to glaze an inverted pyramid with a max. taper of 10°. According to EN 13155 it is necessary for on-site operation that every vacuum circuit holds the rated load with twofold reliability. The Kombi 7211-DS3 is equipped with differently coloured hoses, so that it is easy to recognise each vacuum circuit. In the Kombi 7211-DS3’s highest extension stage, each of its vacuum circuits is able to hold the test load of 2000 kg. Prior to delivery of each vacuum lifting device, we carry out a load test using the twofold rated load of the device. If desired, the customer may partake in this test at our production site in Luebeck and personally convince himself of the device’s efficiency. During the final inspection of the Kombi 7211-DS3, both vacuum circuits are successively subjected to this load test. The test load must in each case be held for a minimum of five minutes without any detectable slipping of the suction cups. A transport frame to store and transport the Kombi 7211-DS3 is also offered. This frame accommodates all the essential device parts and has been designed for simple and fast working. It is even possible to carry out maintenance work while the device is mounted on this frame. For use outside the EU or for internal transport, this device is also offered with 1-circuit vacuum system as a Kombi 7011-DS3. A 9 m long float glass sheet - a world record or only just a European record? All over the world, Henze Glas (www.henzeglas.de), manufacturer of large insulating glass panes from Hoerden/Harz, was looking for a supplier and float glass manufacturer of glass sheets sized 3.21 x 9.00 m.
This looked like an easy job in the beginning, but on closer examination turned out to be rather difficult. It seemed as if no float glass manufacturer wanted to carry out this project. Only Guardian Flachglas in Thalheim did not turn the job down from the start, as the group had already gained experience with the series manufacture of jumbo panes sized 7.20 x 3.21 m.
The ambitious plans were discussed with Henze Glas and our specialists, with the result that Guardian Flachglas could be relieved of the logistic problems of de-stacking (vacuum lifting device by Pannkoke Flachglastechnik) and transport (which was taken care of by Henze Glas). The technical staff of Guardian Flachglas quickly found a solution for cutting the giant sheets to size at the running float band. In January 2005 the time had come. Nine large sheets sized 9.00 x 3.21 m came off the conveyor belt in Thalheim. Now was this a world premiere or only just a European premiere? So far it has not been possible to resolve this question among experts. The premiere started with the morning shift on the 10th of January 2005. The tension was great. Would everything work out well? Under the watchful eyes of the head of the firm and initiator of this project, Dietmar Henze, the huge float glass sheets swung sheet by sheet onto the special-purpose vehicle provided by Henze Glas, suspended from our vacuum lifting device. With many employees of Guardian Flachglas and Henze Glas taking a lively interest, it was possible to achieve what others had not dared to do or had not been able to imagine. The engineers at Guardian Flachglas and the employees of Henze Glas made a good job of it. However, the head of the firm, Dietmar Henze, did not give away which object this delivery was intended for. But we are sure that it will soon be possible to unveil this little secret. Supplier of the special-purpose vacuum lifting device in 2-circuit-technology. The technical supervisors of the Machine Construction and Metal Accident Prevention & Insurance Association, who predominantly oversee construction sites, are organised under the specialised unit “Construction”. 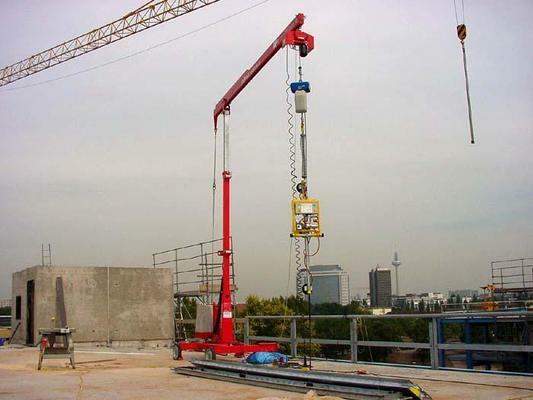 In their session on 8 September 2004 in the Association’s educational institution “Schierke Building”, they dealt with the theme ”The Application of Vacuum Lifting Devices at Construction Sites”. We were invited as one of the leading manufacturers of vacuum lifting devices in Germany. Engineer Kunze of the “Technical Committee for Machine Construction, Hoisting Devices, Mills and Factory Buildings” and Engineer Kammerer of the “Technical Committee for Construction” presented the legal position in the event of accidents. For applications on construction sites, the accident prevention regulation “Load Suspension Gear on Crane Equipment” (VBG 9a) had always posed the higher requirements, to the ban of operatively force-fit load handling attachment. New devices must now comply with Regulation Standard EN 13155. Afterwards, we presented our training course on the handling of vacuum lifting devices as well as the implementation of the standard EN 13155 on a vacuum lifting device. A battery-operated vacuum lifting device of the Type Kombi 7211-DS2 was presented, which was manufactured to have a load-carrying capacity up to 600 kg. for use on construction sites. Additionally the test results from the University of Applied Sciences of Kiel, Germany for individual suction cups under various conditions, as well as its device comparison tests, were presented and commented on. Some theoretical perceptions which apply to the application and design of vacuum lifting devices were actually demonstrated for the technical supervisors. With single circuit systems the leakage of a suction cup or a hose is sufficient and the carrying capacity is no longer warranted when the system cannot compensate the leak. In this case the reason for the leakage occurring, whether a failure on the part of the device or the glass, is irrelevant, as without the partial vacuum in the area of operation - the glass pane falls down. The European safety draft standard EN 13155 requires a reserve machinery capacity, i.e. a multiple circuit vacuum system. With a dual circuit system there are two independent vacuum circuits. If one vacuum circuit loses its partial vacuum the other one is able to hold the load. This standard requires for vacuum lifting devices which are used at construction sites to provide vacuum systems where each vacuum circuit holds the rated load with a twofold safety. Unfortunately not all suppliers provide this, as substantiated by the basic physical considerations and test reports of the University of Applied Sciences of Kiel, Germany. The device Kombi 7211-DS2 fulfills the safety draft standard EN 13155 in every aspect. That every vacuum system of a device must have the ability to hold the rated load with a two-fold safety means this, that on the lower limit of the operating range with both vacuum systems intact it must hold a four-fold rated load. With other devices on the market, where the number of the suction cups as used in the earlier single-systems has not been increased, any assertion to this effect without further analyses is fully questionable. We due to the reserve machinery capacity requirement, doubles the number of suction cups on its dual circuit system devices. Above all, we offer that all our customers have the right to be at the factory’s final inspection in Lübeck to witness the load test with the two-fold rated load. In addition, every vacuum system has its own vacuum reservoir with a non-return valve as well as a vacuum control meter and vacuum measuring device for activating the acoustical and optical warning signal. In case of a power failure a warning signal is also activated. As additional equipment, a luminous-intense flashing light can be attached in order to make the warning signal more widely visual. The device Kombi 7211-DS2 from us fulfills not only the safety standard EN 13155 in every aspect, but also the requirements of safety draft standard prEN 13035-2. Safety draft standard prEN 13035-2 concerns, among other considerations, the application of vacuum lifting devices outside of the factory and is specially designed for the handling of flat glass. For larger devices, a network operation of these vacuum lifting devices is possible. For this reason, we are in the position to produce vacuum lifting devices for 6 x 3 m. panes with a weight of approximately 1800 kg. that conform to the safety draft standard EN 13155. All the technical supervisors were in agreement that the risk of accidents with vacuum lifting devices that conform to the EN 13155 is considerably reduced. The Kombi 7211-DS2 fulfills these requirements. For devices that conform to the safety draft standard EN 13155, there is no longer a discussion of excluded areas of use, as such exclusions are not necessary for such types of devices in the view of modern vacuum technology. 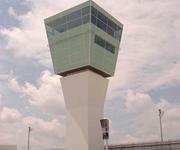 The Erdinger Moos Airport of Munich, Germany has got a new tower for Terminal 2. Insulating glass panes of 5.0 x 2.3 m made of twice-laminated glass 16 mm thick and weighing about 925 kg had to be installed at a height of up to 45 meters as well as 18 mm thick enamelled special glass plates for the tower facing - and this in the 9° upward-sloping tower. The Weidener specialist, Glas Zange (http://glas-zange.de/), possessed the suitable machinery for producing insulating glass of 6.00 m x 3.21 m, underscoring the fact that even unconventional requirements like this tower glazing pose no problem for specialists. For this glazing work, the German Building Employer’s Liability Insurance Association of Bavaria & Saxonia required the use of a vacuum lifting device which fulfills the draft standard prEN 13155. An essential requirement of the draft standard prEN 13155 for vacuum lifting devices is a redundant vacuum system with relevant monitoring functions. Each vacuum circuit must be able to hold the rated load with a two-fold safety. 2-circuit devices are not very widespread on the market. We are a manufacturer that offers such vacuum lifting devices, having started early and intensively to deal with the issue of „redundant vacuum lifting devices“. The Glas Zange company expanded its necessary machinery with a further vacuum lifting device for the tower glazing from us. A Kombi Akku-Device 7211-CeDe with maximum carrying capacity of 1200 kg was ordered for turning through +/- 90°. Additional adjustable supporting feet at the device secure the transport for such extreme glass superstructures like the insulating glasses used for the tower glazing without a risk of shifting the insulating glass structure. Through the combination of the additional counterweight unit „BALANCE 2“ from us, the Zange company was able to execute glazings at angles of 80 to 100 ° under roof projections with a maximum projection of 1.5 m.
In addition to the vacuum lifting device Kombi Akku-Device 7211-CeDe for the large insulating glass panes, the smaller battery-operated vacuum lifting device Kombi 7211-VT from us was also used. This device is also designed with the 2-circuit technology. With these two devices Messrs. Zange is in the position to solve almost every task in the glazing area in compliance with the draft standard prEN 13155. Because safety is very important at Glas-Zange, such investments pay off. A giant mobile crane with a radio remote control supported the experienced staff of the Zange company as well as the vacuum lifting devices of us, enabling them to successfully execute the glazing at an inclination angle of 9°. For Glas Zange the investment decision in the latest device technology was the right step for safeguarding the future. Have you had to glaze a glass pane with a dimension of 3.4m x 1.8m and a dead weight of 285kg? Sure, no problem...if a roof of ca. 1.0m weren't in the way! Around 90 insulating glass panes were scheduled to be replaced by smaller window elements in the five-floor office building. The preset sun protection and its anchoring profile and railing almost made exchanging the insulating glass panes impossible. The available opening was not much larger than the insulating glass pane instelf. The vacuum lifting device "Balance" by Pannkoke Flachglastechnik GmbH in Lübeck was the perfect device for the problem. The overhang was set at 1500mm (to ensure extra space compared to the 1000mm overhand of the building), the maximum deadweight to be transported was set at 500kg. Moreover, the device had a non-fixed counterweight, making it suitable for a construction site! The moving motion was controlled from a battery-operated DC drive. The drive was equipped with a speed control element for fine-controlling the inclination movement. The speed control could also be set from an operation switch. The vacuum generation was done using a separate battery-operated vacuum unit. Pannkoke's concept enabled a quick adjustment to the new operating conditions and a vacuum unit to be used for other cases. The modular structure of the device enabled a quick exchange/replacement of the vacuum unit. Thus, the device could be quickly converted if the construction supervisors demanded a redundant vacuum system. A redundant vacuum system (2-circuit system) increases the device safety in case one vacuum circuit becomes untight. In which case, the other vacuum circuit could handle the normal load, since safety norm EN 13155 for construction sites requires each vacuum cirucit to be able to handle the normal load with a safety factor of 2. Each vacuum circuit is equipped with a separate control vacuum meter and a separate vacuum monitor. If the vacuum of a vacuum circuit falls below the standard, the system issues an optic and accoustic warning to warn the operators of the situation. Besides plane elements, an additional component enables curved curtain walling elements to be transported using the vacuum lifting device Balance. 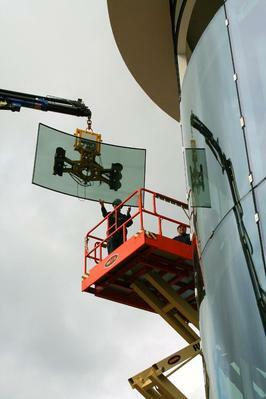 The suction frame was placed vertically on the glazed insulating glass pane, the counterweight was then moved on the suction frame until it was hanging vertically. Once the suction had attached to the insulating glass plate, the holding rail was removed. The counterweight was then moved backward, which tilted the top of the insulating glass plane out of the frame. Thus, removing the insulating glass pane was almost child's play. Transporting the pane to the container below was the easiest part of the job once it had been manoevred past the sun protection. The process was made much easier my the facts that the inclination agle was set at a micro-level and the counterweight of "Balance" was non-fixed; this also minized the safety risk. The company was able to quickly complete the glazing and Weitz appreciated the assignment, that they can implement the next time they receive a similar order. For an office block in Hallbergmoos near Munich, Germany, RP Technik GmbH developed a new installation technique for steel-glass facades in element construction: the filigree System RP-ISO-hermetic 45 with window inset elements RP-ISO-PURAL. The individual facade elements have a height up to 12 m and a width of up to 5 m, for a total of 60 m² of facade in one piece. These mega-facade elements are installed efficiently with ensured quality at the construction site using a mounting device in the horizontal position, completely glazed and equipped with inset elements. With the help of a newly-designed vacuum lifting device these facade elements are installed in the building in pre-assembled anchorage consoles in less than 15 minutes. The entire mounting time, in comparison to conventional mounting, is reduced by approximately one third - and this without a cost-intensive scaffold for the building. This method sets new standard in facade technology. The company RP Technik GmbH (www.rp-technik.de) developed the concept for an efficient production and installation method for facades. The facade elements are completely assembled in the horizontal position at the construction site on an assembling device (illustration 1). These individual mega-elements with a size of 12 x 5 m have a total weight of ca. 2700 kg. The special attachment of the glass-holding cleats of RP steel-glass facades to the carrying profile frame was made possible only through the use of special vacuum lifting technology from us because when such an element is lifted via the glass, this special attachment is the critical link in the chain. In the RP facade systems the glass-holding cleats are fixed with drilling screws directly into the entire profile wall strength and thus reveal very high values in accordance to the pull out power. They are nearly twice as high as for steel facade systems with screw threads and are therefore without equal in comparison to the lower strip thread values of aluminium facade systems used especially in screw thread technology. The facade system RP-ISO-hermetic 45 allows also the simple transport from the horizontal position till the vertical inset to the building via special vacuum lifting devices. The most important advantage is that the full attachment into the steel profile wall copes also with the jerky movements of the mega elements which cannot be avoided when transporting by crane. For the solution to the lifting of the vertical transport and the inset of the mega-facade elements we were contracted to construct the special vacuum lifting device. Because our constructed vacuum lifting device 7201-HVSO needed also to be used for smaller facade elements, the concept for the device was worked out on the basis of two vacuum lifting devices connected together. Each of these vacuum lifting devices has for safety reasons a redundant vacuum system (2-circuit vacuum system). Each vacuum circuit has its own control vacuum meter and vacuum observation. Via an optical and acoustic warning means, a warning is given to the operating staff if the vacuum of one vacuum circuit is insufficient. The mains operated device has also of course a power failure observation system which signals a missing current supply to the operating staff. The newly-developed vacuum lifting device 7201-HVSO from us is designed modularly and can be easily adapted to the corresponding elements because the vertical carrying bars as well as the suction cups are mounted so as to be movable. If necessary, the vertical carrying bars may have to be replaced or the connecting elements may have to be adapted. The device is also extendable through additional vacuum units. It is also possible anytime later to use several vacuum units with rechargeable batteries which would enable one to be independent of the mains supply. For the installation of the completed element, the vacuum lifting device 7201-HVSO is placed horizontally on the facade element. At the lower end of the vacuum lifting device are installation supports, via which the element is lifted, while a crane pulls the upper part of the vacuum lifting device slowly up. When the element hangs vertically it is transported to the place of inset. The installation supports are removed just before the element is placed. The element is positioned with the crane to the exact millimeter and is then lowered to the anchorage console. The positioning and placement of the completed elements takes only a little time. 60 m² can be installed in less than 15 minutes. The entire mounting time, in comparison to conventional mounting, is reduced by approximately one third. Using this type of installation negates the necessity of a complete cost-intensive scaffold for the building because the connection to the building occurs from inside and on each floor. How do you put window elements with a weight of maximum 600 kg in under a roof projection of 1.3 m? For the new building of the ALTANA in Bad Homburg, Germany, the company Schindler GmbH & Co. Fenster – Fassaden – Innenausbau KG had the task to put in safely and efficiently completely pre-assembled and glazed wooden facade elements with a size of 4.1 x 3.5 m and equipped with electrical rolling shutters. Messrs. Schindler GmbH & Co. Fenster – Fassaden – Innenausbau KG from Roding, Germany (http://www.schindler-roding.de/), had to tilt in the elements via the available slots into the holding angles under the ceiling. For this it was necessary to swing the element in an inclined position from below with the slot over the pre-assembled angles. Not easy work at a weight of up to 600 kg. Messrs. Schindler GmbH & Co. Fenster – Fassaden – Innenausbau KG had chosen with us, the right partner in order to construct a mounting lifting device for this task. For this, the vacuum lifting device „BALANCE“ was further developed. It then allowed a ceiling projection of ca. 1500 mm and a maximum weight of 1000 kg. The vacuum lifting device „BALANCE“ has a movable counterweight. To make the device ready for the construction site, the travel movement has to be powered by a rechargeable battery-operated d. c. drive. For the fine control of the inclination movement the drive is equipped with a speed control which can of course be adjusted from the operating switch. The vacuum generation occurs via a separate accumulator vacuum unit. This concept enables a quick adaption to new application conditions and also a usage of the vacuum unit for other cases of application. This modular construction allows also a quick replacement / exchange of the vacuum unit, for example in the case that, from the site inspection, a redundant vacuum system is requires. This is via a quick retrofitting possible at any time. A redundant vacuum system (2-circuit vacuum system) increases the device’s safety in the case that one vacuum circuit is not airtight. In this case the other vacuum circuit could still hold the rated load safely. Each vacuum circuit has its own control vacuum meter and vacuum observation. Via an optical and acoustic warning means, in case of a power failure in one vacuum circuit, a warning is given to the operating staff. Besides smooth elements it is also possible to transport, with an additional structural component, curved facade elements with the vacuum lifting device „BALANCE“ from us. Due to the fine adjustment of the inclination angle with the movable counterweight, the work was essentially simplified, the safety risk minimized and the glazing accomplished very quickly. The company STEELWORK of Berlin received the order for the double glass facade of the new building, Deichtor Center, with a facade area of ca. 6,000 m². This architecturally very interesting, three-sided and ca. 35 m high construction was designed by a Hamburg architectural firm, BRT (www.brt.de). The company STEELWORK, founded in 1993, used three vacuum lifting devices from us simultaneously for this construction. Through the use of on-the-roof movable, mounted rope winches, the facade elements were moved by the three vacuum lifting devices, of the type Kombi 7011-DS, easily and exactly to their correct positions. The facade elements each had an average size of 3.60 x 1.35 m and a weight of ca. 100 kg. The entire job comprised around 1200 of these elements. The battery-operated devices used have a maximum carrying capacity of up to 600 kg in accordance to the design. The size of the suction frame is approximately 1000 x 800 mm. In order to have them adapt to each element, the suction cups are mounted so as to be movable on the suction frame. The Kombi 7011-DS with its possibilities for extensions is very flexible because the suction frame is exchangeable. With that, it is possible to convert the Kombi 7011-DS to a Kombi 7011-DSG within a matter of minutes so that you can glaze curved elements. The point glazing was done by the company Roschmann Glas GmbH. This enterprise also used a Kombi 7011-DS for their work. But as the individual panes were too large for the standard suction frame, the Kombi 7011-DS was equipped with additional extensions. Through the use of these simple to mount extensions, a greater stability is obtained. Each of the extensions has a length of approximately 750 mm. By this construction, a maximum of approximately 2500 mm distance between the two suction cups is made possible, instead of the 1000 mm available through the use of the standard suction frame. Bayer Glasbau GmbH from Berlin got the order to glaze the outer facade of a new building at the Humboldt University in Berlin with 7.000 m² of insulating glass. This at a height of up to 12 m with a sheet size of maximum 4 x 3 m and a weight of up to 800 kg. Bayer Glasbau GmbH developed the concept for the execution of the glazing work. The special challenge was to do the glazing under a projection of 80 cm. 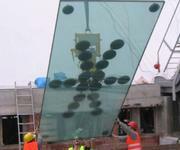 The insulating glass sheets were to be taken from a prepared glass rack with a special glazing device and a high crane. The crane operator was to be directly involved with the glazing work in order to enable the exact control of the crane movements. The angle of inclination of the insulating glass sheets had to be controllable so that the panes could be tilted with a slight inclined position into the frame. This would enable smooth movements without jerking. Furthermore, the 80 cm projection had to be got over. Because work safety is a big subject for Bayer, it also had to be a battery-operated vacuum lifting device. A suitable glazing device was not found on the market. Bayer contacted us and explained both their problem and their suggestion for the solution. We realized this in the form of the glazing device BALANCE , a battery-operated, electronically-movable carrying beam (with a rechargeable battery) and an acceptance possibility for further counter weights on one side and a suction frame on the other side. This newly developed vacuum lifting device BALANCE is equipped with the thousand-fold used and proven accumulator technology from Pannkoke. 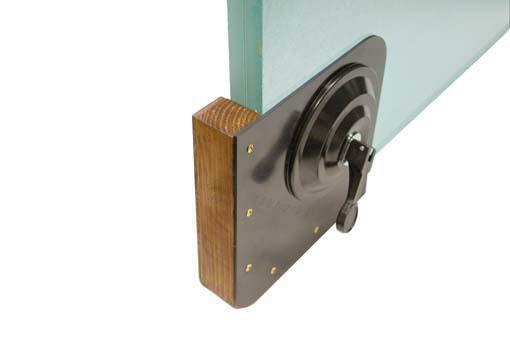 Via the adjustable inclination of the carrying frame with the suction cups it is possible to suction an insulating glass pane without any problems and also to easily tilt it into the frame. The tilt movement is done very smoothly and in spite of this, very quickly. 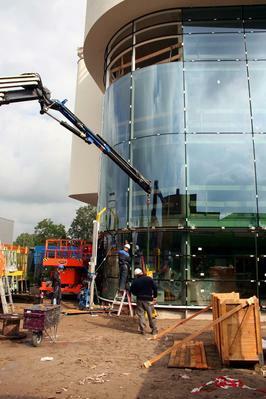 An optimal setting of the insulating glass panes is achieved by the crane operator at the glazing site. Due to the modern radio remote control in the crane this whole procedure is no longer a problem. The setting of an insulating glass pane of 4 x 3 m and a weight of approximately 800 kg takes, thanks to the glazing device BALANCE, only approximately 8 to 10 minutes. Climbers with Glazier Training or Glaziers with Mountain Climbing Training? For many years, we have been developing vacuum lifting devices and are known world-wide as a specialist for these devices. We would like to share some photos of some glazing work on a building in Berlin. One could certainly title these "Glaziers with Mountain Climbing Training at Work". The photos were taken in July 2001 and show the setting of an approx. 300 kg glass pane under the projecting end of a roof - without a stage. According to our information, it took a very long time (more than 30 minutes) to glaze one pane. Unfortunately it was not possible for us to get the information as to which company did the glazing work. The job was done with one of our vacuum lifting devices, the KOMBI 7011-DS . This type is a very universal device for the construction site, but in this case the worker could have perhaps had an easier time of it if the company had invested in a specially-constructed device. Also, whether or not the application of the device for this type of job meets the requirements concerning normal working safety measures is a question we just cannot answer. In such special cases one should use special constructions. The company Bayer Glasbau GmbH from Berlin, for instance, decided on a specially-constructed device to do their glazing work on a new building at the Humboldt University of Berlin. Within 8 to 10 minutes, an approximately 4 x 3 m, 800 kg glass pane was set into the frame. So much time saved made the special investment worthwhile. For a parking garage construction in Frankfurt/Main, Germany at the exhibition area at Rebstockpark, Messrs Terlinden - transparent constructing - from Xanten, Germany received the order to install 10.000 m² Profilit Glass and this with a glass length of over 5,30 m.
The company Wilhelm Terlinden GmbH & Co. KG developed the concept to set in the cut-to-length Profilit Glass from the upper parking floor. The Profilit Glass packages had to be distributed with a construction crane to the corresponding positions on the parking floor. Terlinden wanted to set in the Profilit Glass from above with a small and easy movable mobile crane and a vacuum lifting device. A suitable vacuum lifting device wasn’t found on the market. All vacuum lifting devices which are on the market are only suitable for wider glass elements and not for Profilit Glass of over 5,30 m length. Because working safety is a big issue for Messrs Terlinden, it had be a battery-operated and light vacuum lifting device. The company Terlinden came to us and explained their problem. Within a short period of time we got a special vacuum lifter with the suction cups arranged three on top of each other. The chosen mobile crane was equipped with two chain tensions in order to control the lifting movements quicker and more efficiently. With this device combination it was now possible to glaze economically and without a risk the over 5,30 m long Profilit Glass lines. The newly developed vacuum lifting device Kombi 7011-CXSO for Profilit Glass glazing is equipped with the thousand-fold used and proved accumulator technique of us. Furthermore it is possible to easily retrofit the device, via the simple exchange of a few parts, for other tasks. With that, one is able for example to install not only window elements or insulating glass panes but also glass steps for a stair can be laid. We know well that there is little chance a vacuum lifting device used only for the glazing of Profilit Glass can get full use, because how often has one to glaze 10.000 m² of Profilit Glass? Can you imagine glazing a 12 x 3 m float glass pane with a thickness of 22 mm? This gigantic shop window pane weighs nearly 2000 kg! How would you solve doing such a job? The Shoei Co. (http://www.theglass.jp/) of Tokyo solved this problem with a vacuum lifting device from us. In February 1994 this gigantic shop window pane was installed in a suburb of Tokyo under the observation of many spectators, the press, broadcasters and television cameras. Such an event was unique and newsworthy. Noone had ever seen this before because, honestly, how often do shop windows use such enormous single panes? Messrs Shoei Co. (http://www.theglass.jp/) is a sales partner of us in Japan and has, beside a glass processing factory, also a so-called contract glazing firm. 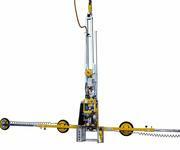 This idea of the owner is based on a car crane with a complete vacuum lifting device selection. The truck is equipped with a hydraulic crane and a built-in 24 V DC vacuum pump. Furthermore, there are several different vacuum lifting devices of us for diverse applications on the truck. Thus everything from normal panes to large-sized curved panes can be effectively handled. In this special case the super shop window pane was delivered in a wooden case directly from the glassworks Central Glass, Tokyo. As things developed, it became apparent that the unpacking and the removal of the case was a bigger problem than the real installation action of the pane. After removing the front side of the case, the vacuum lifting device was set. Each suction cup was checked for correct placing, the vacuum pump was switched on and, after another safety check, the pane was lifted a few centimeters. Because of limited space, the case and the pillow block had to first be removed, as only after that was it possible to start with the real installation. In less than 15 minutes, the gigantic shop window pane, including the outer frame, was installed. The success of an assembly of this size and weight was also a premiere for us, who had developed the special vacuum traverse for this installation. The application of this vacuum lifting device has shown again the safe and economic benefit of the vacuum lifting technique.